Seems that Palm have all their international carrier ducks in a row, with today's news that the recently announced Treo 500v will be making the inter-continental leap from Europe to Australia before the weeks out. In a joint press release, Vodafone and Palm announced that the latest 3G GSM Treo would be available on Vodafone's Australian network and be "priced to enable a broader audience to experience the Internet and email on the go" - meaning 'free'. Of course, no self-respecting free phone offer would be complete without small print and in this case it's " with a two-year contract on a $79 Business Cap". "Today's generation has really embraced the Internet as a way of keeping in touch with friends and family, seeking out entertainment and managing their day-to-day lives," said Olivier Rozay, Palm's country manager for Australia and New Zealand. "We can offer users the choice to do what they want, how they want, when they want. The unique Vodafone interface makes the Treo 500v easy to use even for customers who have never used a smartphone before." Neil Aitken, product manager for Mobile Email Devices, Vodafone Australia, said, "The Palm Treo 500v allows users to experience a host of 3G services that entertain, inform and allow more effective communication. Through our high-speed network, customers can use their Palm Treo 500v for on-the-spot email, messaging and web access. This new Palm and Vodafone offering will appeal to the growing group of consumers looking to enjoy the independence and ease of use of having a world of experience at their fingertips." Announced just weeks ago for Vodafone Europe, the Treo 500v is a first for Palm in a few different ways: first device to run Windows Mobile 6 Standard, first device to feature a "widescreen" display and first device without a touchscreen. It also features a brand-new carousel-style interface developed exclusively for Vodafone's networks and services, including their 3G "live!" functions. The Australian version will be available for $749 AUD upfront or $0 on a range of 24-month contract plans from Vodafone. $0 contract plans include the $79 MyBusiness Cap, 24-month plan and Vodafone's range of Business Cap 24-month plans. 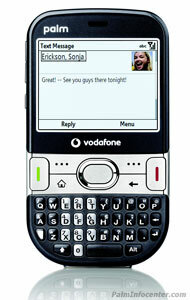 The Treo 500 comes with a full qwerty keyboard and a 240x320 Transflective display with support for 65k colours. It has a tri-band GSM radio supporting the 900/1800/1900 bands and UTMS 2100. It includes 256MB memory with 150MB available for user storage and a microSD expansion slot. It also features a 2 megapixel digital camera and a Bluetooth 2.0 with EDR and stereo headset support. A mini USB port is provides for charging and connectivity as well as a 2.5mm headset jack. A removable 1200mAh battery is present for a claimed 10 day stand-by rating with 4.5 hours of talk time. It has dimensions of 16.5mm (D) x 61.5mm (W) x 110mm (H) (.65" x 2.4" x 4.3" inches) and weighs 120 grams (4.23 ounces).